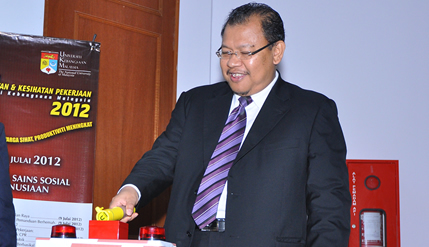 BANGI, 10 July 2012 – The Faculty of Health Sciences has won the 2012 Work Place Safety Award in the faculties category in conjunction with the launch of the Occupational Safety and Health Week (MKKP) of The National University of Malaysia (UKM) today. Second place went to the Faculty of Pharmacy. They received grants worth RM3,000 and RM2,000 respectively and certificates. The Medical Molecular Biology Institute won in the Administrative and Institutes category with the Vice-Chancellor’s Office coming in second while the Pendita Za’aba College won in the residences category followed by Rahim Kajai College in second place. The awards were presented by Deputy Vice Chancellor (Academic and International Affairs), Profesor Datuk Dr Noor Azlan Ghazali in conjunction with the launch of the week-long campaign. Chairman of the Occupational Safety and Health Committee (JKKP), Profesor Dr Amran Abdul Majid said inspections and evaluations of all the premises were carried out between March and June regardless whether applications for participation were submitted or not. Organised by the Social Sciences and Humanities Faculty (FSSK) and JKKP, the week is held every second week of July in response to the call made by the National Safety and Health Council for vigilance in workers’ safety. The JKKP is charged with ensuring the safety and health of staff, students and visitors in the campus. An exhibition of safety equipment and personal health tests is being held at the FSSK concourse in conjunction with the campaign. Among the agencies and units taking part are the security department, the Fire Services and Rescue Department and the National Institute of Occupational Safety and Health (NIOSH). Health tests and a blood donation drive is also being carried out by the UKM Medical Centre together with a road safety campaign in the campus. Talks on healthy life-style living and the do’s and don’ts in an emergency were among the many activities being held during the week.